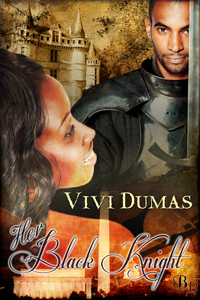 The Valentine Interview Series continues with Vivi Dumas, author of Her Black Knight. Be sure to leave a comment at the end of this interview for a chance to win an ebook. Visit Vivi's site to enter a giveaway to win a Kindle. Gwendolyn Braxton was born in the wrong century. She submerges her life into the study of the Renaissance Era. She is the resident expert on all things Arthurian in the DC Metro area, maybe even the U.S. Unfortunately, none of her knowledge helps her to find her own Knight in Shining Armor. Actually, as a Black woman in Washington D.C., it runs men off like the plague. To make things worse, her mother has stepped in to fix her before she plunged into spinsterhood. Morien Knight is far from home in search of an artifact lost in history, a history he longs to emerge himself back into. His small sabbatical from his mission to participate in the Kentland Castle Resort Renaissance Faire might lead him to exactly where he belongs. Morien learns when dealing with the poetic lessons of his old friend, Merlin, things may not always exist as you expect. Tricia: Welcome,Vivi. Please tell us about yourself and why you decided to be a writer. Vivi: Well, let’s see. I’m a wife, mother, sister, daughter, and employee. Then, after all that I’m a writer. I began writing from my love of reading. A time long ago a young girl had lofty dreams of writing poetry and stories about crazy adventures. She came from a family where writing wasn’t a serious career aspiration. Then life stepped in and really doused the flame of creative and the young woman turn in her pen for a gun and joined the army. Fast forward…many, many years later, a woman sits with her children reading. As the saying goes, from the mouth of babes. My girls say, “You can write this, Mom.” And my writing career began. Tricia: How would you categorize your romantic writing? Vivi: My stories are definitely steamy and the shorter the story the steamier it gets. Vivi: Currently, I have one full length novel, Soul Catcher, out. It’s a paranormal romance with a host of supernatural beings. The second novel will be out shortly, hopefully in March. I have a vampire short story, Salvation, which is released by Decadent Publishing. My time travel short story, Her Black Knight, was just released by Breathless Press. My F/F/F paranormal short story, Red in the Hood, is a part of Rumpled Silk Sheets: Lesbian anthology published by Ravenous Romance. Vivi: That is not a fair question. I have a lot of authors I love. I don’t think I can choose a favorite. Someone of the top choices are Shelly Laurenston, Jeanniene Frost, J. R. Ward, and Jennifer Ashley. Vivi: My greatest challenge is time. I have a lot going on in my life and time is very precious. I try to use my writing time wisely, which I’m an epic failure at. So, this year my challenge to myself is to use every writing opportunity to its fullest. Hi Trish! Thanks for having me.